Myth #1 – It is fine to put a new roof on top of an old one. Surprisingly, this is done more often than you might think and even some building codes do not counter it. The reality is that this is a bad practice for a couple of reasons. The first is that removing the current shingles lets you see the condition of the deck underneath so that any damage could be repaired. Just covering it up could result in the new materials not lasting as long as they should. The second is that you are adding extra weight to your roofing structure, which it might not be able to handle. Finally, when you go to do the next replacement, it will cost even more to remove extra layers. Myth #2 – New roofs do not need regular maintenance for a long time. It doesn’t matter if you have a new roof or one that is 15+ years old — annual inspections should be done to catch any problems that could have occurred. 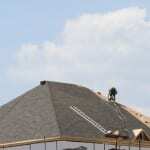 Even the best quality new roofs can suffer from damage that needs to be repaired promptly. Myth #3 – There isn’t any water damage inside, so my roof is fine. While a severely damaged roof will likely result in noticeable water damage inside a home, that doesn’t mean there isn’t a problem that is resulting in water damage you cannot see. Water can find its way to places you wouldn’t imagine and cause humidity issues in your home, wood rot, and mold growth. If you would like factual and truthful answers to your questions about roofs, don’t hesitate to contact us at Slippery Slope Roofing. We give each customer our undivided attention, handling one roof at a time, so you get the best service and results for your installation, replacement or repair project. Call today to learn more!